Diane Kelly » New Release! Death, Taxes, and Sweet Potato Fries! New Release! Death, Taxes, and Sweet Potato Fries! Just released! Death, Taxes, and Sweet Potato Fries. Book #11 finds IRS Special Agent Tara Holloway up against violent human smugglers and kidnappers, as well as a crafty person exacting vengeance by issuing bogus 1099s. All while planning her upcoming wedding! Loved it as always! Currently my favorite series – is it really ending? It’s been so much fun spending these years with Tara, and I’m so glad you’ve enjoyed the books! We’ll have one more full-length book and an electronic novella, and then we’ll be moving on to a new series. I hope you’ll love those books just as much! I’m really looking forward to reading “Death, Taxes, and Sweet Potato Fries”! I just posted a review of this wonderful series on the tax blog I contribute to. You can check it out at https://surlysubgroup.com/2017/03/09/death-taxes-and-a-beach-read/ I will miss Tara once the series ends! Thanks so much, Leandra! You made my day! Thank you, Diane! That’s great to hear! 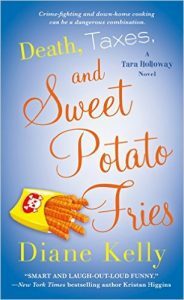 I just finished “Death, Taxes, and Sweet Potato Fries” and it was as much fun as the others! I also read and enjoyed “Love, Luck, and Little Green Men”–Erin is such a fun heroine! I think I’m going to have to try the K9 series next. It was very clever to have “Death, Taxes, and Mistletoe Mayhem” be a crossover–now I want to read more about Megan Luz and Brigit! I just finished Death, Taxes, and Sweet Potato Fries. Loved it! I live north of the Metroplex, but have resided in Dallas and neighboring suburbs in the past. It’s pretty cool to read about the different places I’ve actually been. Thanks for making Tara, and the rest of the characters so fun to read about. I’m so sorry to read the series is coming to an end. I’m looking forward to your next book, Tara’s wedding. So glad you’ve enjoyed the books, Sue! It’s fun to feature the DFW area in the books since this is home to me, too. The end of the series is a bit bittersweet. I’ll miss Tara and the gang, but I’ve got some fun new characters and stories in mind that I hope my readers will enjoy just as much.